Dandelion Jelly – Sunshine in a jar. I know that there are those who see dandelions as a nuisance but to me they are an early promise of warm summer days, sunshine, and time spent laughing with friends. When I came across this recipe on line, I just had to give it a try. After all, who can resist an jar full of sunshine and happiness. I modified the recipe found at A Teaspoon of Spice. I was worried that it would taste like flowers, but it doesn’t. Instead, it tastes like mild honey. 3 cups of fresh, young dandelion flowers. Must be harvested from an unsprayed location. This is a lot of flowers. Find your favorite Netflix series, podcast, or person to visit with. 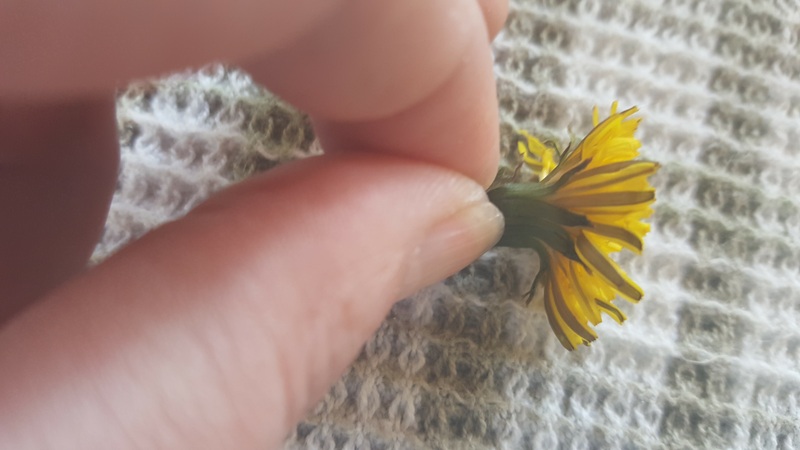 Carefully pull the dandelion petals from the green sepals. This is tedious work and will take some time. Get comfortable. You may find that your fingernails will end up dyed the colour of mud. The dye can last for a week or so. Don’t use the green parts. Put the dandelion petals into a large heat proof container. Boil the water and pour over the dandelion petals. Cover and place in the fridge overnight to steep to make a strong dandelion tea. Dandelion Tea ready for the fridge. The next morning, strain the petals out of your dandelion tea. I used a reusable coffee filter. A paper coffee filter would work well too. Set up your canner and start boiling your jars to sterilize them. Measure out 4 ¼ cups of sugar into a separate bowl. Add the dandelion tea to a largish, heavy bottom pot. Add ¼ cup of sugar, lemon juice, and the pectin. Bring this mixture to a boil. Add the remaining 4 ¼ cups of sugar and bring to a full, rolling boil for 1 minute. Ladle into clean jars and process in a water bath canner for 10 minutes (adjust for altitude). Enjoy your jar of springtime sunshine. It is delicious on hot buttered toast or with peanut butter on a PB&J. That is a lot of flowers! How wonderful you have a space where you can collect that many clean, and untainted blossoms. It really looks like bottled sunshine too. does is have a mild scent like chamomile when it’s done? she gifted me with her recipe for rose petal jelly, written in her elegant spidery script….. one pound of petals is a great deal of picking too! Even half a recipe is worth the work. It’s more of a very thick syrup, but it was heavenly. I remember her fondly. If you have a source for un-sprayed scented roses you are more than welcome to the recipe. What a lovely gift and a wonderful memory. My jelly didn’t really have much of a smell – no floral overtones at all. I would love the recipe if you are willing to share – thanks for the offer. 1 pound freshly picked scented rose petals. Un-sprayed. plus 2 whole cloves….this was her secret ingredient!! 1] wash and pat the petals dry. 2] sprinkle on 1/4 or so of the sugar and gently massage the sugar into the petal…use more if you think you need to. 3] refrigerate, covered, for a day or two…glass is best for this. 4] Place into pan with the water and the rest of the sugar and the “secret” cloves and slowly bring to a gentle boil and cook until it is a thick-ish syrup. Place into sterilized jars and seal. This was way before canning was hyper about the 10 min water bath… do what you feel most comfortable with. Red and pink roses give the best color, but add some scented yellow ones if you need to add to the weight. If I lived in an area with abundant roses I might be tempted to experiment. We had a late start to the season and my bushes in my remaining bit of garden were covered with just opening roses. I was so happy as the last several years of bizarre weather did in all the roses before they even started to bloom. I went to bed last night planning to pick them today or tomorrow. Torrential wind and rain just after midnight did them in again!! Besides the lovely jam, I guess it is the elusive nature of getting the harvest just right that makes this like a special Unicorn Sighting…..there is always next year…. Ouch, your poor garden. Deer usually eat mine. Thanks for your gift of your friend’s recipe. I am honoured.